2019 kicks off in style with our first stop on our UK tour at Mother’s Ruin Gin Palace in east London on Sunday 3 February. Register for your free tickets here and find out more about this event and other stops on the tour here. Click this programme image to see inside the full WOFFF18 programme. Our 2018 Festival Report has full details of all the films which took home the WOFF18 prizes. WOFFF18 at Picturehouse Duke of York’s, Brighton and Depot, Lewes screened two feature films, 58 short films, and hosted workshops, panel events, talks and filmmaker Q&As. Thanks to everyone who made WOFFF18 such a great success! See you all at Depot in 2019. 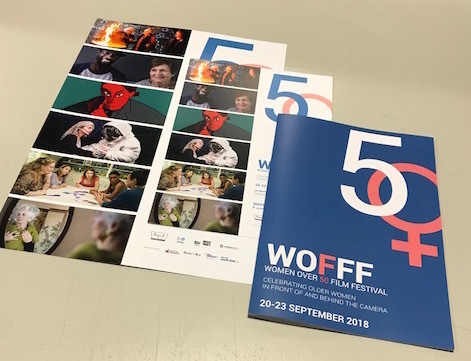 Women Over 50 Film Festival (WOFFF) champions and showcases the work of older women on screen and behind the camera with an annual short film festival and year round events and film screenings. WOFFF addresses the ageism and sexism many women face in the film industry. We screen films celebrating older women on both sides of the camera. We believe inclusive spaces to watch films together and conversations between generations of women can help make older and younger women feel less isolated and feel more connected. WOFFF is a volunteer-led and volunteer-run Community Interest Company. We’re a friendly, inclusive bunch and would love you to become part of our community. Everyone is welcome at WOFFF. Anyone can submit a film to WOFFF or attend our events: there’s no upper age limit and all genders are invited to submit films and come to our festival. In 2015 we held our first prototype festival – Short Hot Flush. We screened 27 international short films, hosted a panel event and awarded prizes for the top four films. In 2016 we screened 44 international short films, hosted an all-female panel event and a beginners’ filmmaking workshop, as well as awarded prizes for the top five films. Find out more here. In our 2017 festival we screened 55 international short films, hosted an all-female panel event and 8 workshops, along with awards for the top films, including an Audience Choice Award. Find out more here. Film submissions are open until 15 July 2019. For a film to be eligible for submission to WOFFF it has follow this simple rule. The film has to have a woman over 50 at its centre on screen OR have a woman over 50 in the core creative team (writer, director or producer). Head over to Filmfreeway for full details on how to enter your film to Women Over 50 Film Festival 2019.